Ellen DeGeneres Relatable - Exclaim! John Cena On Hosting The Ellen Show Today, Kacy Catanzaro Reacts To Ricochet - RAW, Curt Hawkins - Wrestling Inc.
Ellen Lee DeGeneres is an American comedian, television host, actress, writer, and producer. 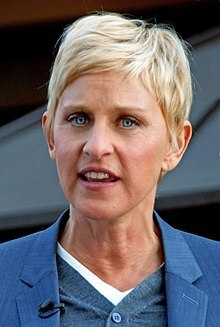 Degeneres starred in the popular sitcom Ellen from 1994 to 1998, and has hosted her syndicated TV talk show, The Ellen DeGeneres Show, since 2003. Her stand-up career started in the early 1980s, culminating in a 1986 appearance on The Tonight Show Starring Johnny Carson. Carson likened her to Bob Newhart, and invited her for an onscreen chat after her set; DeGeneres was the first female comedian invited by the iconic host to join him for such a discussion, at a time when such an invitation was widely regarded as one of the most influential endorsements available for a comic. As a film actress, DeGeneres starred in Mr. Wrong (1996), appeared in EDtv (1999), and The Love Letter (1999), and provided the voice of Dory in the Pixar animated films Finding Nemo (2003) and Finding Dory (2016); for Nemo, she was awarded the Saturn Award for Best Supporting Actress, the first time an actress won a Saturn Award for a voice performance. In 2010 she was a judge on American Idol for its ninth season. DeGeneres has hosted the Academy Awards, Grammy Awards, and the Primetime Emmys. She has authored three books and started her own record company, Eleveneleven. She has won 29 Emmys, 17 People's Choice Awards, and numerous other awards for her work and charitable efforts. In 2016, she received the Presidential Medal of Freedom from President Barack Obama.